Overview : Keep 'em Together. It doesn't get any thinner than this! This Ultrasuede® slipcase prevents scratches on your cell phone. The elasticity of the pocket keeps it flat when empty and stretchy enough to hold your bluetooth or earbuds safely. Low profile slides easily into your shirt or jeans pocket. Comes in three sizes for a perfect fit on your Apple iPhone 3G/3GS, Samsung Instinct, HTC Touch Diamond, HTC Touch Pro, LG Dare, Blackberry Bold 9000, Blackberry Tour 9630, Blackberry Storm 9530/9550/9520, Blackberry Curve 8310/8320/8330, Palm Pre, Sony Ericsson Xperia X1, Nokia E71 or the Google Android G1. Available with or without the new pocket. Having purchased a SEIDIO Innocase II and Innocase Holster for my Blackberry Tour, there may be times where I didnt feel like carrying my holster but wanted the slight protection for my screen. Even though I have a Clarivue Screen Protector on my screen since day one, I just don't like any screens on any of my phones to be exposed. I purchased a cheap soft drawstring pouch on eBay but it was a tight fit and I was barely able to close the pouch. I happened to stumble upon the WaterField Designs Suede Jacket Cell Phone case. The cell phone case is made out of a soft, scratch-free microfiber: Ultrasuede™. Ultrasuede is a completely synthetic material. The suede is smooth as you expect and would not damage or scratch your phone/screen. The suede jacket I received was size 51 for the Blackberry Bold 9000. A naked Blackberry Bold will fit perfectly inside the suede jacket (sorry no pics). However, if you have a Blackberry Bold with SEIDIO Innocase, it won't fit. A Blackberry Tour 9630 with SEIDIO Innocase is a perfect fit (just a wee bit snug). A naked Tour would be slightly loose inside the case. Of course, a naked Blackberry Curve 8330 would be a little loose inside the jacket as well. For an additional charge of $4, you can add a pocket. The pocket is sewed onto the suede and is made of neoprene/spandex type material. This pocket stretches and allows you to insert your credit card, drivers license, money, business cards and other items. I was able to fit 11 cards with the ability to add more if I needed but who really has 11+ credit cards? Of course, adding this much will definitely add bulk. You can even use this pocket to store your stereo headset, handsfree headset, spare battery...pretty much anything you can think of that is small enough to fit. Conclusion : Overall, the WaterField Designs Suede Jacket Cell Phone Case is a wonderful case. It protects your phone from scratches and minor bumps. Not only does it protect your phone, but you can also use it to clean your screen. Unlike the suede made from animals, this suede is 100% spot and machine washable. It would be nice if WaterField Designs included a drawstring on the opening and can be used as a universal case for other cellphones, accessories or other electronics like MP3. Different sizes for different devices. Not universal. Overview : More than a universal all in one charger, the Overlife will store energy to reload any devices independently. It is your ideal nomad companion. Overlife is a small, black shiny design nomad battery. Just plug it to any USB port or wall plug, and you can directly charge any Motorola - Samsung - Nokia - Sony Ericsson - Samsung - iPhone - iPod - Mini USB - NDSL - NDSi and all PSP models. You can also store energy in, so you can charge any of your devices on the go. A blue LED indicator shows you the level of charge and the charging status. This perfect nomad companion will avoid you traveling with numerous bulky chargers, and provide emergency power in any situation. 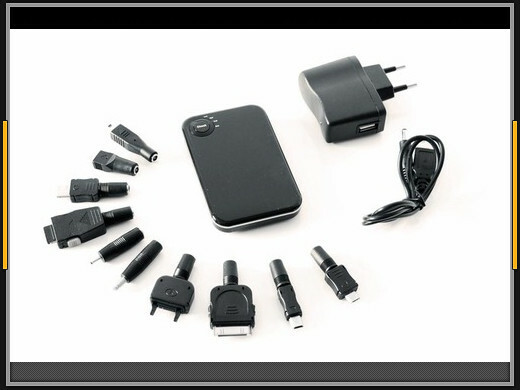 Inter-changeable connector heads charging different mobile phones, MP3/MP4 player, iPod, iPhone, PSP, NDS, etc. Power indicator LED shows battery capacity level. Powerful power supply is enough for even the most power-hungry mobile devices. Charging time: 3 ~ 3.5 Hours. Quality/Usability : Sometimes I forget to charge my PSP, DS, iPod and most importantly, my Blackberry cellphone. Its worse when you're not near a wall outlet, computer or have your charger on you. These days, majority of portable devices can be charged via USB. Talismoon has developed a product to help give you enough power to beat that boss on the last level or to help you get through you long commute with your music/movie or even that last minute call to your wife/mother. The Talismoon Overlife Charger has a nice piano black gloss casing but can be a potential to be a fingerprint magnet and scratches. The front has a "CHECK" button. Around this button are 4 LEDs. When you press the "CHECK" button, blue LEDs will light up that will display whether the battery is LOW, HALF or FULL. If Overlife is fully charged, all three blue LEDs will be lit up. As the charge slowly dissipates from charging other products, the LED next to FULL will get dimmer and dimmer. As more charge is drained from Overlife, the LED will get dimmer until it is fully discharged. The fourth LED is when the Overlife is in use (USE) and lights up blue as well. I personally dont know why Talismoon choose this method of display when you check the status of battery. I would of preferred a single LED to tell me if its full, half or low. Having the LEDs dim can get a little confusing considering its a little hard to tell by the brightness of the LEDs. Or even a single LED that changes color to let me know how much power is left. The charge time on this is a little disappointing. It takes about 3 hours from a drained Overlife to a fully charge Overlife. I can live with 1.5-2 hour charge but 3 hours is a very long time. To charge the Overlife, you can use the included USB cable. However, this USB cable has two purposes...one is to charge the Overlife and one is to charge other devices. Simply connect the USB cord into the USB out port at the top of Overlife, attach one of the heads to the other end of the USB cable and start charging! The USB out port has a rubber cover to protect it. Unfortunately, this cover doesnt come out or pull out. You will have to pull it back. Sometimes, this can get in the way. Would have been nice if it came out further. Overview : Engineered with industry- leading gaming technology from Razer, the Razer Arctosa comes with outstanding features like fully-programmable Hyperesponse™ keys with macro capabilities, customizable software profiles with on-the-fly switching and 1000Hz Ultrapolling™, giving you the competitive edge to perform faster and better in-game. Say goodbye to amateur hour; your gaming abilities can be brought to the next level now. The Hyperesponse™ keys of the Razer Arctosa reduce key latency and maximize response for critical actions during competitive gameplay ensuring fast, accurate and consistent actuation response in the intense frenzy of competitive gameplay. The Razer Arctosa addresses "ghosting" signal failure that occurs when you press multiple keys simultaneously on traditional keyboards. Selective anti-ghosting around the WASD gaming cluster on the Razer Arctosa allows more commands to be entered at any one time without the "ghosting" signal failure. Quality/Usability : Although this keyboard is mainly for PC and PC gaming use, this review mainly revolves around console gaming with the use of XFPS 4.0 Force for PS3 and Speed for Xbox 360. This can also be used with XFPS Rateup for PS3 and XFPS Sniper Plus for Xbox 360. The Razer Arctosa came in a very nice packaging. The keyboard was packed in black cardboard box with a black sleeve case in the middle of the box that holds the manual, software CD on the back of manual, stickers and inserts. You can install the software on the CD (which the program connects to the internet and downloads the latest software) or download from Razer's support website. I personally prefer to download from the support website since it usually contains the latest updates. I'll discuss a little further about the software below. The keyboard is well built and excellent quality. The keyboard is black as well as the lettering on the keys. Black on black looks nice on cars but not so good on this keyboard. It makes the letters difficult to see in low light conditions. Holding the keyboard at a certain angle, you can see the letters and numbers since it shines. Since I have a desk lamp on top of my computer desk and my keyboard on a keyboard draw on my desk, its hard to see since the top of the desk overshadows the keyboard and blocks the light from the desk lamp. The Arctosa is a very sleek looking keyboard with a nice profile. On the bottom top of the keyboard are feets/stands that flip out to provide some height. The palm rest can be removed by loosening a few screws. I wonder why the used screws to hold it in place rather than clips. Overview : Nothing feels better than having the freedom to do the things we love without being tied down by wires. The CERULEAN F1+TX gives you the freedom of wireless sound from your iPod, mobile phone or computer. It delivers crisp, clean stereo sound and superior headset functionality in a sleek and compact design that's attractive, easy to use and feature filled. The CERULEAN F1+TX was built with iTunes in mind and integrates flawlessly. It also works well with other audio applications on your PC or Mac for a hassle free listening experience. If you have just upgraded to OS X Leopard, don't worry.... it works there too. Since everybody has a unique pair of ears, we ship the F1 with two different earhook shapes. They are designed to be comfortable and keep the F1's in an optimal listening position at all times. Charge your F1 and TX using any powered USB charging port or USB 5V(DC) wall charger, power options are endless. Your F1 is fully charged in just over 2 hours and ready for over 8 hours of continuous music play back. You can get up to 10 hours of talk time on a single charge. The CERULEAN F1 features full Bluetooth 2.0® compatibility and contains the necessary profiles to work with many of today's Bluetooth® mobile devices. Listen to audio from iTunes®, DVD's, CD's or any applications wirelessly. Listen to and remotely control your iPod wirelessly. Stream stereo music from your iPhone and use your F1 headset for phone calls simultaneously. Compatible with most mobile Bluetooth devices for hands free calls and music. Quality/Usability : With how technology is advancing in today's world, wireless is starting to play a major part in our lives ranging from mobile phones, internet, music players and remotes around the house. Cerulean thought they would chime in on the wireless technology by releasing a wireless combo known as the iSkin Cerulean F1+TX, for our beloved iPod and cellphones. The F1+TX allows you to listen to your iPod without the hassle of cords dangling from your headset and doubles as a hands-free headset for your mobile phone. The F1 is the model of the headset. The TX is a small dongle that attaches to your iPod. Included with this package is a USB cable for charging the F1, pair of alternative ear hooks, foam earphone covers and extra rubber rings for the earphones. Also included is a USB adapter for the TX so that you can stream music from your computer to the F1 heaset. The F1 heaset looks similar to some of the bluetooth headsets you see on the market for mobile phones but instead of only one, there are two. Both are connected via a small cable. All of the controls are on the right headset. The face of the headset features a multi-function button (Play and Pause) with an LED status light. The back has an ON/OFF switch. The top has a NEXT and PREVIOUS track controls. The bottom has a Volume UP and Volume Down buttons as well as the USB charging port. A small microphone is on the front of the F1. The TX dongle does not have as much features or buttons on it. All there is on the TX is iPod plug with a USB charging port to the left side of the TX and a LED indicator on the front face. It's compatible with any Apple device that uses the standard 30-pin connector. According to iSkin, the first charge should take about 6 hours but any charge after that should take only 2 to 3 hours. With new products that requires charging, I usually let it charge overnight. With moderate use of listening to music only, the F1's battery lasted a couple of days. If you forget to turn off the headset, you'll obviously drain the battery more quickly. Once the F1 is fully charged, you'll need to pair it to the TX. To do so, its similar to that of pairing it with your mobile phone. Plug the TX into the iPod and turn the F1 on by holding down the multi-function button. Thats it! The TX draws its power from the iPod battery so you will experience shorter battery life on the iPod. The F1 doubles not only as a headset to listen to music on both the iPod or mobile phone but it is also a bluetooth headset. But do remember that when you're using the F1 to listen to music on your mobile phone, that you phone must be A2DP compatible. Not all phones will allow you to use stream music to a bluetooth headset. You'll need to pair the F1 to your phone. The process is the same but without the use of the TX. Simply set your phone into pair mode and hold down the multi-function button on the F1. Once paired, you can use the controls on the F1 to answer calls (press once), ignore calls (hold down until you hear a beep), adjust the volume, redial, and place calls on mute or hold. Overview : Finally a single cable to connect ALL your consoles to your TV! No more switchbox's needed, this cable can handle it all. Finally you can free up those extra inputs on your TV for other devices! Fully Compatible with Xbox 360™, Wii™, PS3™/PS2™, PSP Slim™, Xbox™ consoles. Built in switch prevents interference of other consoles while in use. High Quality and High Speed of Transfer Signal. Supports DTS 5.1 Channel System. Supports DOLBY Digital Surround Sound. Supports Optical Signal on Xbox 360™. Compatible with Surround Sound Receiver or Integrated Amplifiers. Supports D2 (480i/480P); (720i/720P) & D4 (1080i/ 1080P) technology. Quality/Usability : XCM has released another multi-console component cable but unlike v2, v3 supports not only Xbox360, Wii, PS2, PS3 but now PSP and the original Xbox! This is an all-in-one cable for your whole entire entertainment center. There are five plugs for your console: PSP, PS2/PS3, Wii, Xbox, and Xbox 360. On the other end are the component cable inputs that connect to your TV. On the "switcher" itself, you have six switches: PSP, PS2/PS3, Wii, Xbox, Xbox 360HD and 360SD. So just switch to the system you are playing with. The quality of the cable is sturdy and very durable. The visual quality that the cable outputs is on par with that of the stand alone cables. I did not see any ghosting or any lag. The colors were bright and crisp from what I have seen during the testing. Switching between consoles only took a couple of seconds for it to be displayed. However, switching between consoles on the switcher can be a little annoying. Sometimes you'll "overshoot" the switch that you want. So you'll have to slowly push the switch. In my original review of the Multi-Console Component Cable v2, I mentioned that the cable from system to system is fairly long. Its long enough if your system was near or next to each other. But after upgrading my entertainment center and having my systems in different locations, the cables were not long enough especially if you have them on different shelf heights. The cable from the TV to the switcher has a decent length to it. Conclusion : Overall, the XCM Multi-Console Component Cable v3 works great like its predecessor. Quality and build is sturdy. Visual quality is great as well as the color. However, the length of the cables from system to switcher and to other systems isnt long enough if you have systems in different locations or on different shelves. If you have majority of the systems and they are near each other, you wont have all those cables dangling and it frees up your AV slots. However, if you only have 1 or 2 systems, this is not worth the cost. The price tag of $39.99 is fair but $29.99-$34.99 would be the sweet spot. Overview : This adapter converts Micro SD / Micro SDHC / T-Flash into a MS Pro Duo and to be used with the growing number of MS Pro Duo compatible devices such as Sony PSP, PDAs, digital cameras and cellphones. Quality/Usability : With different electronics available comes different media storage. Like everyone, you probably bought a memory stick for a device and the device either broke, got something new or is no longer being used. So what are you to do with those memory sticks? You either let it sit on your shelf and collect dust, try and sell it or reuse it with the help of an adapter. Sony has their own like of memory sticks and their highly popular sticks right now are the Pro Duo. But the prices are fairly high compared to other cards on the market. A 4GB MS Pro Duo can cost as much as $60. It use to cost over $300 when it was first released and depending on brand. Currently, the 8GB costs just as much as the 4GB when it first released. Within a couple of months, these prices will drop dramatically to a more reasonable price but it would still be expensive. SD cards are also a very popular and highly used format. With technology advancing, so are the sizes of memory sticks. The TransFlash also known as microSD/microSDHC (SDHC is higher capacity) which usually comes with an SD adapter is proof. microSD's are used in cellphones, PDAs and camera's with the use of the adapter. But the price is what makes it very affordable and highly used in electronics. A 1GB microSD can be purchased for $10 or even FREE after rebate. Manufacturers are always looking of ways to provide a solution on using other memory cards in other devices. The microSD to MS Pro Duo Adapter is similar to that of the Kingmax microSd to Pro Duo Adapter. This review was tested with both a normal 1GB microSD card as well as a 4GB microSDHC card. Both cards fit flush inside the adapter. The adapter is the same exact size as a SanDisk or Sony brand Pro Duo. During our tests, we did not notice any slow down during reading and writing to the microSD with the Pro Duo adapter. Conclusion : Overall, the microSD to MS Pro Duo Adapter worked just as it should. If you have extra microSD's laying around or dont want to pay for the high priced Pro Duo cards, you might want to check this out. However, the quality of the adapter is cheap. The plastic is very lightweight and thin compared to SanDisk or Sony brand Pro Duos.